Not just Jenny from The Spot! Access Melbourne meant the start of the BCom journey for Jenny Nguyen, leading to the full FBE experience and culminating with a graduate position with NBN. I’m Jenny Nguyen’s first meeting for the day, one of four. Her exams are finished but she isn’t having a break. As we sit down to talk study, graduation and more, I get the sense that ‘busy’ is the way Jenny prefers it. Jenny joined AISEC, drawn in by the global youth network’s aim to offer cross-cultural experiences while allowing students to develop their leadership qualities. Serving first on the general committee, then Director of Finance, and later, Managing Director of the University of Melbourne chapter in 2016, she has loved every minute of the experience. Even after graduating, Nguyen is still planning on volunteering her time to work as part of the national marketing committee for the group, but first, after helping over 100 University of Melbourne students volunteer with AISEC-organised projects overseas in 2016, she finally has time to go on one herself and is leaving mid-December for a 6-week education project in Thailand. Had you always wanted to study Commerce at Melbourne? Nguyen: Not necessarily, I was always a high-achieving student and good at maths and accounting, but I didn’t go to what I guess is a ‘typical’ University of Melbourne feeder school. I went to Caroline Chisholm Catholic College and it was sometimes hard to keep pushing myself to do well when others in the class weren’t as motivated as me. In Year 10 I became really interested in the environment and concerned about global warming, so for a while, thought about studying science at university. Besides AISEC, what have been some of the highlights of your experience studying in the Bachelor of Commerce? Nguyen: In my second year, I went on an overseas Accounting subject where we toured some really big companies like Pepsi Co, Mastercard and Disney – it made me see accounting so differently. For example, there was a concern within the entertainment industry where 'creative accounting' was used to work out how to pay actors – you wouldn’t believe all the loopholes! Another highlight is one of the enrichment opportunities the Faculty offers: their Career Mentoring Program. I was paired with Savio Hapuarachchi, who is the Program Manager - Network Deployment and Commercial at NBN. He really made time to offer some great advice and also challenged, questioned and listened to me. He’d ask things like: Who are you? What is your passion? We also discussed his approach to a career. For him, it wasn’t about the money – it was about making an impact and working somewhere he felt connected to. The more he spoke about NBN, the more I felt like I also agreed with their vision; so much so, I applied for their graduate program. You’ve landed a grad role with NBN, congratulations! You had a few interviews this year, what are your tips for students? Go beyond experience - Considering interview questions and answers what I found helpful was talking about my skills. When an employer would ask about my experience in a particular area, I’d provide an example of my past work experience, but then I’d also add, “However putting the title aside, this is what I’ve learnt from that experience”. I’d emphasise the value and skills I could bring to the company instead of talking just about experiences I've had. Be genuine - It’s important to show the kind of person you really are and try to build a relationship with the people you meet in the interview, or show how you can do this with your answers. Never assume a company wants you to be a certain kind of person – just be yourself. Look for the perfect fit - Once I got an interview I did a lot of reading and research about the company. I’d read about its vision and mission statement. You might think these things are meaningless but they say a lot about the company culture, and while companies are looking for people they think are right for them, you also need to ask yourself if they are right for you. I was really lucky that I got offered a grad role with two great companies, and the reason I chose NBN was the cultural fit. I really felt connected to what they wanted to do in Australia. If you went back to your old high school now, what advice would you offer about university study? Nguyen: The Bachelor of Commerce was not what I predicted the program would be like. I really put myself out there and got a lot more than I expected. University was such a rollercoaster ride for me! Sure, you’re studying really interesting subjects, but at the same time, you’re also figuring out who you are, figuring out what you want to do. It has enabled me to discover what I’m passionate about and it’s given me so many opportunities. Secondly, I think it’s important not to just participate in activities simply to add them to your resume. In some of the internships I participated in, I could sense that some students were just putting in the bare minimum, and the experience would not have been valuable. I think it’s really important to push yourself to the limit and reflect on how the experience has shaped you and what new skills you’ve learnt from it. How are you feeling about graduation? Nguyen: Graduation is going to be really bittersweet for me. I’m proud of everything I have achieved in the BCom and with AISEC. I’ve enjoyed my time here so much, it’s going to be hard to adjust not coming to the University next year, but I feel really well-prepared for my role ahead, and am excited by the possibilities. 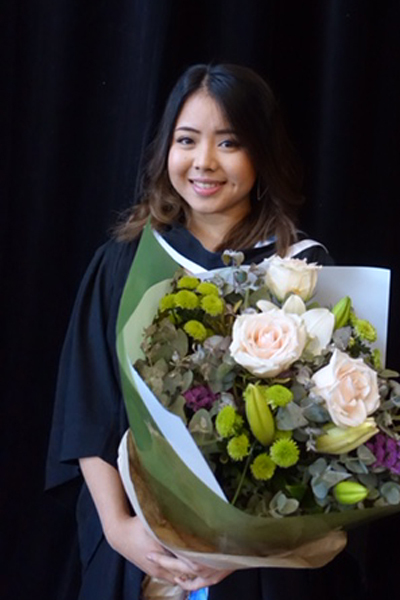 Jenny Nguyen was offered her place in the Bachelor of Commerce through Access Melbourne. Access Melbourne offers several categories to assist students in studying at the University of Melbourne, through scholarships or a guaranteed place at Melbourne if you’re from a rural area or have a disadvantaged financial background.